If you’ve ever applied for a credit card or for a loan, you know how important your credit score is. But what if your credit score needs a little, or a lot, of work? Do you know how to fix it? Read on to find out the steps to fix your credit, as well as why it’s important. Believe it or not, rebuilding or fixing your credit can be even harder than starting from scratch. You want to show lenders and financial institutions that you’re responsible with your credit and that you’ll make your payments as agreed upon, but there are some dings and slip-ups (or maybe even some outright disasters) on your credit report that suggest otherwise. Thinks of it this way, you’re running a race. Instead of starting on flat ground, you’re starting downhill, and you need to run up the hill as quickly as you can. Fortunately, even though fixing your credit usually takes a bit longer than building your credit, the steps are pretty similar and easy to implement. 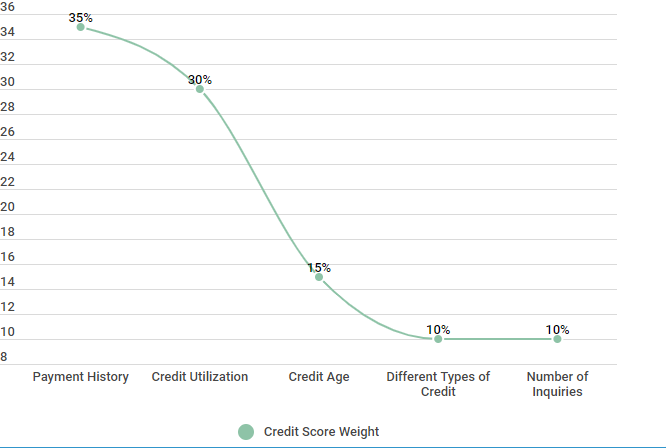 As you can see from the data below, there is a substantial part of the population that is working to improve their credit score, at any given time — especially among those with fair or good credit. Bad credit can happen at any time for a number of reasons. Perhaps there are unpaid debts in collections that you had simply forgotten about. Maybe you had to file bankruptcy, or you’re in the process of going through a divorce. There could be inaccuracies listed on your credit report, such as late payments that weren’t late. Or, even worse, perhaps you have been the victim of identity theft and there are all sorts of accounts on your report that are definitely not yours. No matter the reason for the bad score, it’s important that you know how to take action quickly to fix your credit score. Source: Survey of 1000 members and non-members who have a credit score. Let’s take a closer look at some steps you can take to fix your credit score. If you are trying to improve your credit score, first, rest assured that you are not alone. Fortunately, fixing your credit is relatively easy if you follow a few key steps and stick with a routine. Your payment history is the single biggest factor that impacts your credit score, contributing to 35% of your score. As such, the best thing that you can do for your credit score is to make your payments on time, each and every month. Late or missed payments will remain on your credit report for 7 years, dragging your score down. Making your payments on time will go a long way toward improving your credit score. 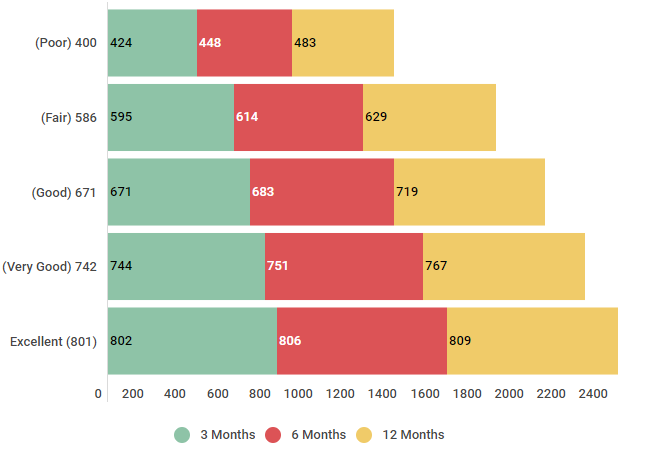 We looked at a number of individuals who made all of their payments on time over the course of a year, to see how their scores improved. Source: Review of individuals who for the course of a year made all payments on time. As you can see from the data, making on-time payments can have a significant impact on your score, especially if your current score is less than stellar. For instance, those with poor credit saw their score rise by more than 80 points in 12 months — just by making their payments on time. We understand the dilemma — you need to use credit to improve your credit score, but it’s hard to get approved for credit with a low credit score. If this sounds familiar, you’re not alone. A good suggestion to help build up your credit score is to sign up for a secured credit card. A secured credit card is easy to qualify for. These accounts require a deposit, which then becomes your credit limit. If you miss a payment, the lender simply withdraws the funds from your deposit. As we mentioned earlier, your payment history plays a huge role in your credit score — these on-time payments will be reported to the credit bureaus, improving your score. We surveyed more than 400 consumers over the course of 24 months, to see how their scores improved by using a secured credit card. 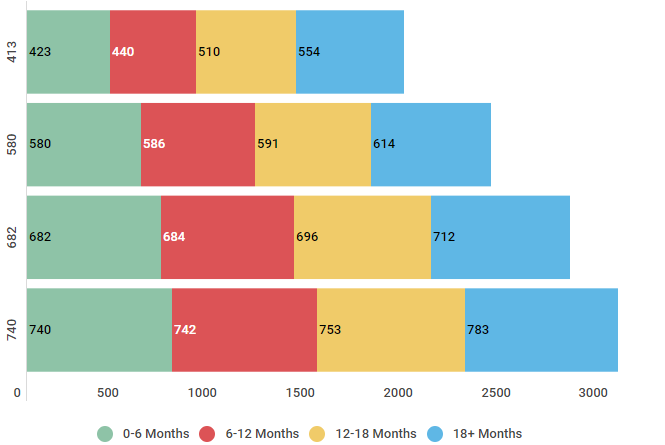 Source: We surveyed 455 consumers over the course of 24 months to understand on average how long it takes to move between credit ranges starting 2/15/2016 to 2/15/2018. Regardless of where their credit started, everyone saw an improvement in their score by using a secured credit card — and their scores continued to improve the longer they used the cards. Another option for fixing your credit score is to get a credit builder loan. When you apply for a credit builder loan, the bank will set aside a specified amount into an account. You make payments on this loan, and at the end of the term, the money is yours. Your payments get reported to the credit bureaus, improving your score. Here’s the average impact from using a credit builder loan. This is a great strategy to use, especially for those with poor credit — who saw an improvement to their credit score of 141 points in just 18 months. Becoming an authorized user on the account of someone with established, good credit is another way to help improve your score. There is less risk assumed on the part of the lender, since at the end of the day, the person who’s ultimately responsible for the debt is the person whose account you’re on. When someone adds you as an authorized user to his or her account, it is a huge expression of trust — so be sure to use this strategy wisely. Let’s look at some data to see how becoming an authorized user can affect your score. Everyone, regardless of where their credit started, saw an improvement to their score within the first 6 months by becoming an authorized user. The biggest difference was seen by consumers who started out with a 583 credit score — their scores rose, on average, to 662 in less than 2 years. A somewhat similar strategy, getting a co-signer for a loan or for a credit card is another way to repair your credit. By co-signing, your co-signer is essentially agreeing to be ultimately responsible for your debt, in the case that you default on your payments. Like becoming an authorized user on someone’s account, this is a responsibility that you should take seriously, since if you default on your debt, your score isn’t the only one that could be hurt. Below are the average score improvements by adding a co-signer. As you can see, especially for those consumers who started out with poor credit, it can make a tremendous difference. For instance, the consumers who started out with a 370 credit score saw an improvement of more than 200 points to their credit score in less than 2 years. We spoke to Credit Sesame member, Roselee, to find out what steps she took to fix her credit. Here’s what she had to say. We interviewed Roselee on August 28, 2018; She is 48 years old, a single mother of one teenage son, and works as a secretary for a rental company. She lives in Daytona Beach, Florida. Were you able to fix your credit score? I didn’t think I could be able to at first, but I started slowly and I was able to fix it. Looking back, it was no one’s fault but my own, so I am glad that I learned more about credit scores and how important they are to one’s financial life. What was your original score and what is your score now? My original score was just fair. I never knew I was supposed to keep track of that type of stuff. The first time I checked it, it was 660. My score as we speak is 772, so I went up from fair to very good. What steps did you take to improve your score, and how long did it take? The first thing I did was look for any inaccuracies on my credit report, which I found that there were 6 of them. I sent letters regarding these to all three credit reporting bureaus and it took about 6 months for them to be cleared off. At the same time I started to make sure that all my payments were made on time, and worked to get my credit cards under 30%. It took 16 months but I am finally closer to my personal goal of having excellent credit. Roselee’s story is important because it stresses the importance of focusing on the basics. 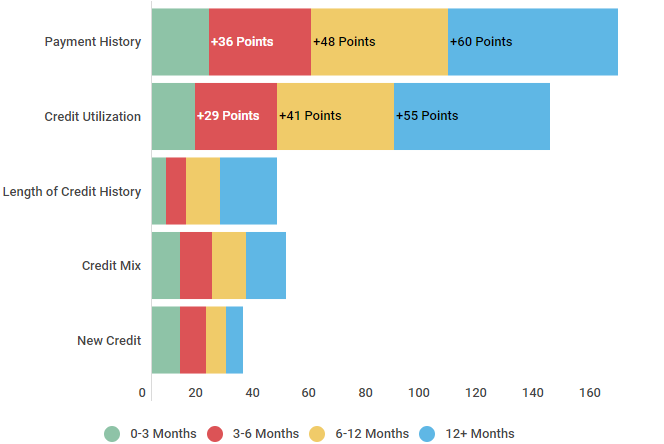 She carefully reviewed her credit report, disputed and resolved the errors she found, and then focused on smart financial habits to improve her credit score. In order to better understand how to fix your credit score, it can be helpful to know exactly what factors contribute to your credit score, or what is included in your credit report. Read on to learn more. What is included in your credit score? Credit scores are reflective of a scale that represents poor to excellent. The FICO scoring system is the most commonly used and scores range from 300 to 850, with higher scores reflecting better credit. There are a number of factors that contribute to your credit score, and these are reflective of the information that can be found in your credit report, a detailed history of your relationship with credit that is reported to the three major credit bureaus (TransUnion, Equifax, and Experian). For the purpose of this article, we’re going to look at FICO’s scoring model calculation factors and their weights (FICO is the most well known and most commonly used scoring model). Is your credit report always accurate? As stated above, your credit report is a comprehensive way for potential lenders and other financial institutions to have a better understanding of your financial history and your relationship with credit. And, as thorough as your credit report may be, keep in mind that it may not always be completely accurate or updated. While some consumers have bad credit from irresponsible decisions with their credit, others have poor credit through no fault of their own — and they often don’t even know it. Take a look at the numbers below. While inaccuracies are steadily on the decline for both members and non-members alike, there are still a significant number of consumers who found inaccuracies in their credit reports in 2017 (an average of 27% — or more than 1 in 4 consumers). Source: Survey of 500 members and non-members who check their credit reports yearly. Survey was done in December annually. If you’re one of those consumers who found inaccurate information contained in your report, you’re probably wondering how to dispute the information and long it will take to get the error(s) resolved. Fortunately, the majority of consumers who found errors were able to have the issue resolved (74% of members and 62% of non-members) — and relatively quickly, at that. 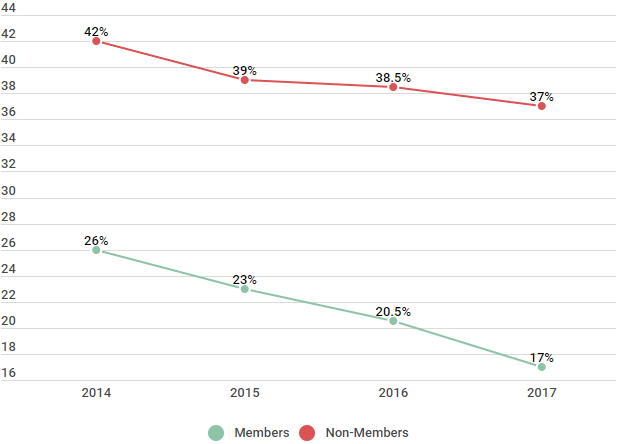 Members reported less than 45 days for their errors to be resolved, with non-members just slightly behind, at 45-60 days. 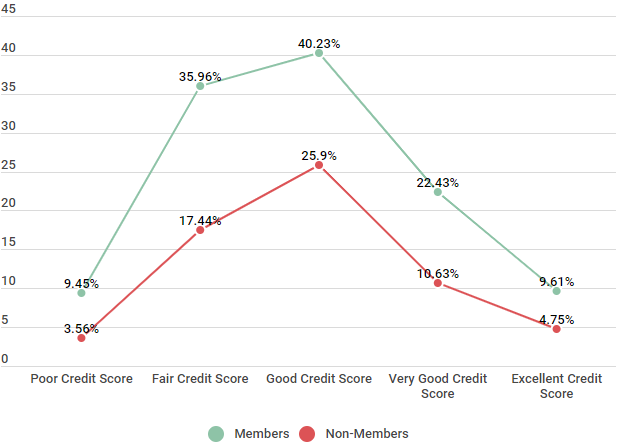 Source: Survey of 500 members and non-members who found inaccuracies on their credit report. Survey completed over the course of 9 months from December 1, 2017 – August 1, 2018. Fortunately, the majority of consumers who found errors were able to have the issue resolved (74% of members and 62% of non-members) — and relatively quickly, at that. Members reported less than 45 days for their errors to be resolved, with non-members just slightly behind, at 45-60 days. How long does it take to rebuild your credit history? So now that you know how to fix your credit score, you’re probably wondering how long it will take to see an improvement, right? The good news is that, by taking the right steps, you can start to see an improvement quickly — typically within the first couple of months. Source: Survey of 750 members who actively worked on improving their credit score. Survey completed over the course of 24 months from 2/15/2016 – 2/15/2018. It’s no secret that credit plays a huge role in your everyday life. Everything from the interest you pay on your credit cards to whether or not you get approved for a loan to buy a new car is directly related to your credit and your credit score. By taking the necessary steps to fix your credit score now, you are setting yourself up for financial success in the future. In conclusion, if your credit score needs some work, you are not alone. Fortunately, there are several tried and true steps that you can take to improve your credit score, regardless of where your credit stands now. Check your credit report, fix any inaccuracies, and then focus on the basics — make all of your payments on time and think outside the box for various ways to qualify for credit, whether by applying for a secured credit card, taking out a credit builder loan, or becoming an authorized user on an established account. By taking these steps, you are already on your way to a better credit score — and a brighter financial future. For some reason I can not sign in to Credit Sesame. However, I did receive an alert concerning Land Home Financial. This was disputed and resolved in 2014. This must be removed from my credit file.